We’re following all the Super Tuesday Results as they roll in and updating all of our pages on each of the candidates live. 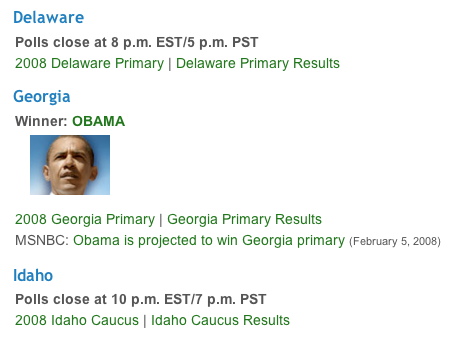 Make sure you watch the [[[Super Tuesday Results]]] page where you can see all the updates at a glance. Mahalo News Team FTW!!! Check it out! This entry was posted in Mahalo and tagged Mahalo, results, supertuesday. Bookmark the permalink.